Artist Kim Crisler doesn't just photograph dogs for her career. She loves them period! That's one of the reasons she became a "proud person" of two adorable dogs! Her life changed when she adopted a Jack Russell Terrier named Lucy. 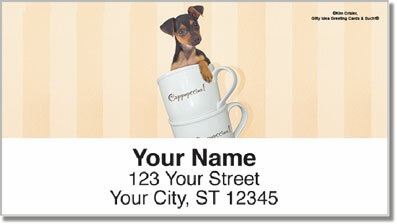 In addition to being her best friend, Lucy became her muse when she did photographs for her company Gifty ideas. 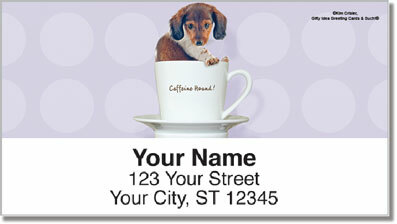 Recently, they added a miniature dachshund named Oscar to their family. Her love of dog comes through in her sleek, professionally photography and the way she manages to capture the innate soul of each of her subjects. 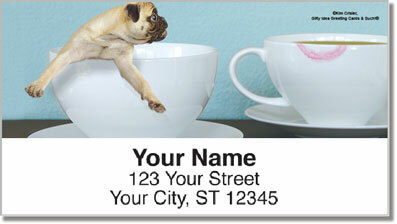 Each label brings a fun, stylish personal touch to your mail. 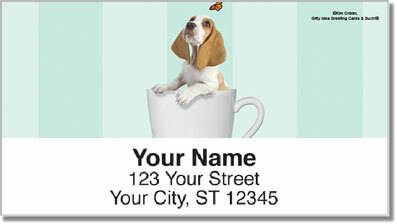 Show that you're the proud person of an animal with these adorable Pups in Cups Address Labels today.